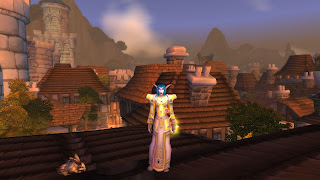 Daybreak: Greetings and transmog lewts. The first post on a new blog is always daunting for me. I never know what to say beyond the usual "Hi, hello" so I'll just cut to the chase. I needed a space to post my fanfiction stories, transmog adventures, and ridiculous LFR experiences. Too many of my Facebook friends leave "WTF" comments and "You're such a nerd" every time I post anything WoW-related and I'm just sick of them slapping the gamer stigmas on me. But here, I can post whatever I want and the majority of readers will likely be WoW players anyway. My most completed transmog set so far is on my priest. She is wearing the replica Vestments of the Virtuous that can be obtained from the Darkmoon Faire. For anyone interested in picking up the replica set, the belt from this set is identical to A'dal's Gift. It will save you from having to grind the 55 faire tickets if you haven't already completed the quest line in Netherstorm that begins with Warp-Raider Nesaad. I really wish I hadn't vendored my Light's Justice since I think it will go so nicely with this set. I might go farm it out if I have the time/patience; we'll see. Hammer of the Penitent will do for now but I don't like how it has the same exact glow of Prophet's Scepter. I need a staff to use with this set just in case I find a good epic staff. Ironstaff of Regeneration is a clean, simple one. Staff of Divine Infusion is nice also, even though it has no yellow tones whatsoever. The stark whiteness of it might actually be a nice break from the pale yellow of the gear.